The Lake Garda is the second biggest lake of the Italian Lake district after Lake Maggiore. This lake is unique not just because of the size of the territory, but also – and mainly – due to the variety of its characteristic ambient: large beaches exists perfectly together with vineyards and olive branches, and towards the north the hilly scene gives its place to the imposing backgrounds of the high mountains. 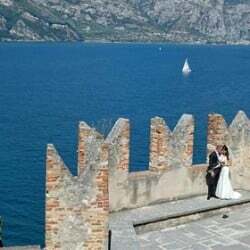 To this spectacular nature, you can add the ancient art, rustic culture and a bit less known, but not less wonderful villas than those of Lake Como, so you find a perfect mix for a dream ambient to realize your very special wedding event. The Lake offers really a wide choice of splendid places, but nothing is comparable with its peninsulas. To give you the feeling of an island, but still remaining on the mainland – which can be an important factor when you organize the logistics of your wedding (!) – the Lake offers you two very special peninsulas. 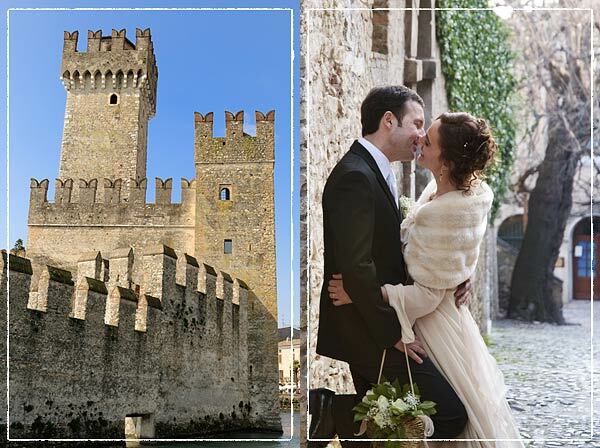 The first one, and most known of them is the ancient town of Sirmione, located on the very south of the lake. This really popular touristic target is an incredible mix of the past and future with all the contrasts one can imagine. The rests of the roman Villa called “Catullo’s Cave” is just one of the signs the rich past left to us. Walking around the historical center, one can feel a growing curiosity inside to discover the tenacious past, that is hidden and present at the same time in the architecture, the decoration of the buildings, the small details of every little street…. But in Sirmione all this can be in a perfect harmony with modern shops, designed bars, inviting restaurants and a complex spa center to pamper your body and relax your mind. 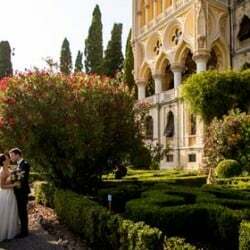 To complete the picture and make Sirmione a perfect place for a dream wedding, there is the splendid Palace Hotel Villa Cortine just on the lakeshore with its centenarian park full of rare essences and lively colored flowers. The old Villa completely renovated with its precious marbles and symbolic frescos gives the opportunity to celebrate a very special wedding with the splendor of the past and the pleasure of the art, with the breathtaking lake view as background. 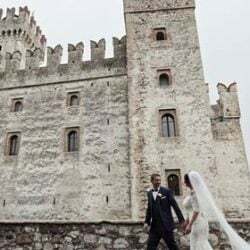 In this way, you can be really close to the dynamic life of Sirmione center, but still have your privacy and intimacy of the wedding reception within the walls of this splendid hotel. The second peninsula is less known, and offers a completely different style, far from busy turistic centers. At the extremity of Garda’s Golf, at the last south-western point of the Baldo Mountain, you can find Punta San Vigilio, one of the most celebrated, but also the most romantic places of the Lake Garda. We know very little about the origins of this location, although it is sure that was inhabitated already in the roman’s time. The Point of San Vigilio is a wonderful little treat of sophisticated beauty, enclosed between the mountain and the lake. The splendid lake panorama, and the mountain just behind creates a unique mix of rich colored scenes, so that you can feel yourself as being in a painting. The ancient villa built by a solitary man, was the residence of numerous important guests such Maria Luisa from Austria, the zar Alessandro II, Winston Churchill, Laurence Olivier the artist, and Carlo of England. Countless of artists and poets visited San Vigilio to get inspiration from this spectacular landscape. 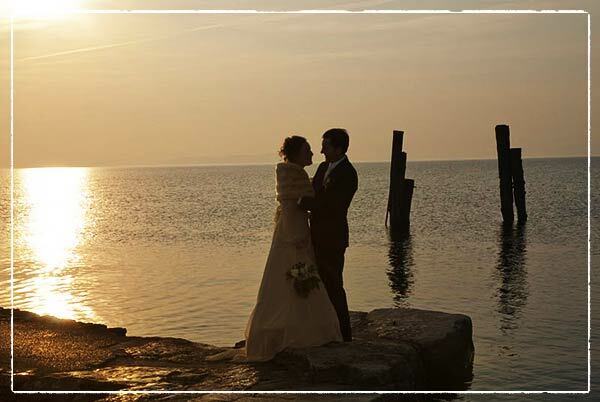 Thanks to the large gardens of the Locanda and the small restaurant in the port, San Vigilio offers itself also as a very romantic scene for a really intimate love celebration, where you can have inspiration for the poem of your future life together. Having the blue water all round, with the mountains just behind, with great traditional cuisine of the Garda area…intimacy and romance, beauty and nature, closeness of busy centers with full of life, but still have the event “just for you”….this is the great mix of the peninsulas of Garda, offering themselves as one of the most romantic locations for your wedding in Italy. 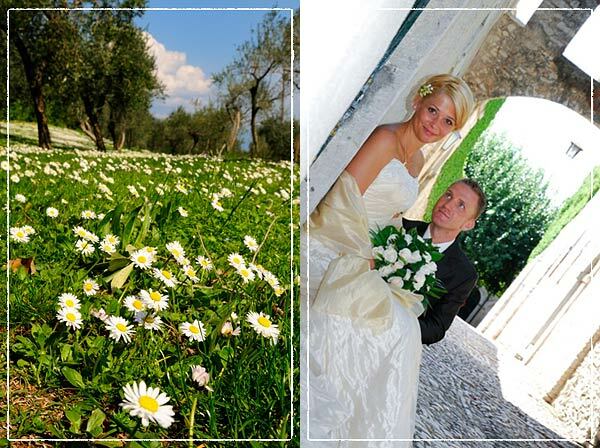 For any information about wedding in Sirmione and Punta San Vigilio, lake Garda please CONTACT US. Started to work on wedding photographs in 1989, so a good 20 years ago, Flavio Sartori arrived to develop it’s unique style of the colours’ usage mixing the art of painting with photo shooting. He likes strong colours and their contrasts to use in order to underline the key meassage of the pictures. Always looking for new creative stimuli in his free style photograph, without poses, he reaches real feelings on his spontaneous images. 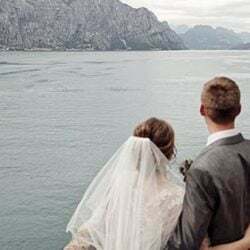 His strong point next to the spontaneity is the care and responsibility with which he follows his weddings: he is there until the end to make sure that all is fine with the client. This is because he has 1 thing very important in this profession: the true passion to capture the moments forever. To learn more about him and his work visit www.extraordinario.it . ← Have a wedding question? Ask the Expert! 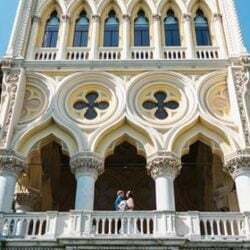 Me gustaría casarme en Sirmione en agosto, pero una boda íntima (sólo nosotros 2). Podría ser una boda civil? Qué fechas disponibles hay en agosto?